Netflix, you are having the worst week ever. In additon to a dismal performance in the stock market as well as the recent tiff that will lead to removal of popular Starz content from the service, it was rumored last month that Dish and the wounded, limping chain Blockbuster were teaming up to take on Netflix in the streaming market. 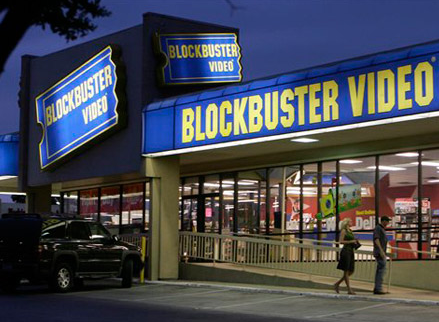 While Netflix has a massive hold in the arena, Blockbuster is brand with a long history in the US despite its recent troubles and could conceivably lure new customers based on its former prominence across the US. As we mentioned in the initial post about the rumored service, Blockbuster could also come in with an edge in the Dish pairing- the removal of a barrier to streaming, not requiring the purchase of additional equipment like a Wii or a Roku player. Another advantage the Dish-Blockbuster partnership could arrive claiming is price- while Netflix’s service is relatively reasonable $7.99 per month, the company has bled a million subscribers since its unpopular price hike September 1st. The combination of factors could strongly prime the market to accept the new kid on the block as a viable and attractive streaming option. The second-largest U.S. satellite-TV company will hold a press conference on Sept. 23 to announce subscription costs and other details for the service, according to the person, who declined to be identified because the plan isn’t public. Dish was up 1.8 percent Friday.